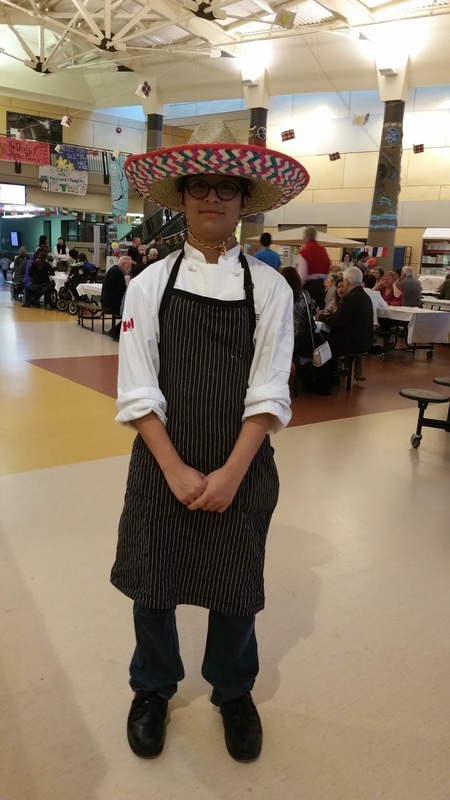 Gheremy Padua, still in high school in Vancouver BC Canada was a student trainee at the recent Rotary Burnaby International Food Festival last April 8th, 2016. He was in the Philippine booth where he was deep-frying the lumpia (LUM -PI-YA with a short i) – a vegetable spring roll popular in Filipino cuisine as a snack, appetizer or a side dish. Although his parents are from the Ilocos region of the Philippines, another Filipina coached him on how to make lumpia for the Food Festival. However Gheremy said he tweaked the formula a bit unbeknownst to his coach and his take was a hit – a major one especially with a picky non-Filipino 13 year old boy who had four lumpia rolls that night. Here's the ratios I used for the lumpia. Salt and pepper the mix. 2 cups of finely shredded carrots, celery and onions. Roll it in large lumpia wrap and shallow fry in a pan and make sure the heat isn't too hot. You can tell it's too hot by seeing if it's smoking or not. I think that's all there is to it I snuck in a few sprinkles of cinnamon when I made it but that was just to build internal heat and aid the sweet and spicy sauce. It is important that the carrots, celery and onions are finely shredded or diced (not minced) or julienned) for the right texture crunch. The dish described here is technically lumpiyang gulay – or veggie spring roll. As you know there are many kinds of spring rolls. Also, Gheremy showed me the wooden toothpick test on how to tell how hot the cooking oil is. If you dip a wooden toothpick or spoon in the frying oil and it begins to create white bubbles – then the oil is too hot for the lumpia.